For the first half of this century, during one of the longest active political careers in this country, Winston Churchill was interested and sympathetic to Zionism. Hating tyranny in all its forms, he had reacted strongly against the Tzarist pogroms in the first years of the century and always understood the desperate need of a haven for Jews. Churchill’s own efforts to help establish a Jewish national home in Palestine were at their most intense throughout 1921 and 1922 when, as Colonial Secretary, he was directly responsible for the evolution of British policy in the Middle East. 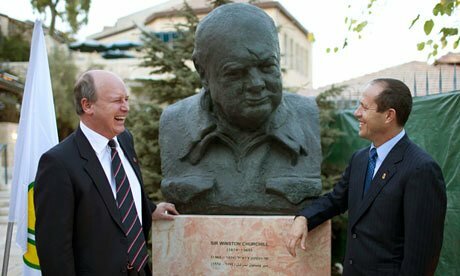 Churchill reiterated this view when he spoke to the Peel Commission in 1937, telling them that he had always believed that the intention of the Balfour Declaration was that Palestine might in the course of time become “an overwhelmingly Jewish State.” During the Second World War, although most of his Cabinet colleagues rejected this idea, Churchill clung to it and on many occasions intervened with senior Cabinet Ministers to prevent “an Arab solution” of the Palestine question being permanently fixed. His electoral defeat at the end of the war meant that he could not carry out the policies he had outlined and had to watch powerless as Labour’s Palestine policy was put into effect. In 1952, four years after the establishment of the State of Israel, Churchill wrote, comparing the Greeks and the Jews: “Centuries of foreign rule and indescribable, endless oppression leave them still living, active communities and forces in the modern world, quarrelling among themselves with insatiable vivacity.